Hunter Shea does it yet again. The man is a writing machine, pumping out great tales left and right. He has already perfected the art of the novella. This was my first time reading one of his novel-length stories. Let me tell you, I was not disappointed at all. CREATURE is a slow burner that’s packed with several scares. There are books that satisfy the horror hunger that dwells within us all. CREATURE is one of those books. It has an old-school vibe, but it delivers a modern fright for the ages. 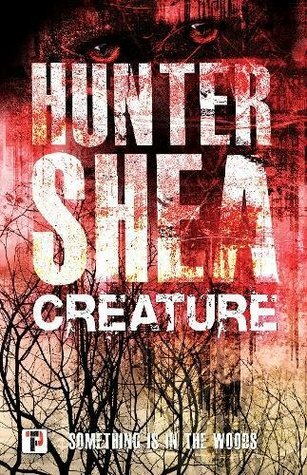 More importantly, the book felt real, like Hunter Shea had firsthand experience with some of the things that happen in the book. The character building is superb. I would love to spend more time with Kate and Andrew Woodson. Kate is in chronic pain, and she has numerous autoimmune diseases. Andrew is working for the medical benefits that help keep Kate alive. The Hudsons need a change of scenery, so Andrew rents a lake cottage in Maine. All seems well until it isn’t. The atmosphere and foreboding will keep you on the edge of your seat. Hunter Shea paints a scenery that you get lost in. You are right there with the Woodsons in the lake cottage. You feel and hear what they do. You can sense something bad is going to happen. The creature is everything. I’m talking its rock throwing and the aftermath it leaves behind. The creature tries luring the Woodsons out of the cottage with its screeches and other loud noises. I have goosebumps just thinking about it all. You know you’ve read a great book when you are smiling after you turn that last page. I don’t know how Hunter Shea keeps churning out terrifying stories that feel original, but I want more. Thank you for the amazing review, brother!!! You rock hard! Definitely one of my Shea faves!